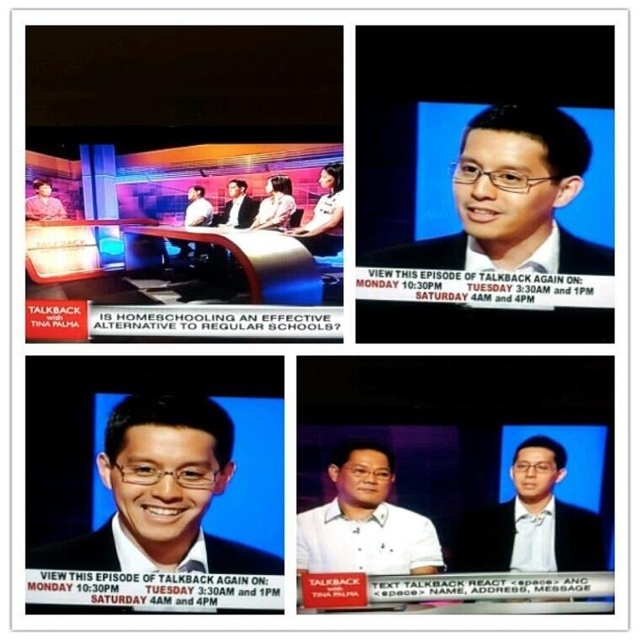 Edric was interviewed on Talk Back with Tina Palma on ANC along with Assistant Secretary of Department of Education, Jess Mateo, homeschooling mom, Moira Bunyi and her son, and homeschool graduate, Julia Garcia. The question Tina was trying to answer was “Is homeschooling an effective alternative to regular schools“? I thought the interview went very well but they inserted comments and opinions of parents and educators who did not really know much about homeschooling. And their biggest argument against it was SOCIALIZATION. 1. It is NECESSARY for children to learn from their peers and with them. 2. Homeschoolers have limited socialization therefore it is a disadvantageous education. I would like to present a case for homeschooling that debunks the socialization claim. But I will begin with certain premises. Premise # 1: God created people to be relational. In the garden of Eden he said it is “not good” for man to be alone. So he made a “suitable partner” for Adam — Eve. In the same way, it is not good for a child to be alone. A child needs relationship. Premise # 2: The family is the first and most important social unit — Husband and wife, then parents with children, and siblings with one another. Every society will agree that the family is fundamental to the survival of their values, cultures, and traditions. The is no debate here. Just go online and research “What is the most important social unit?” and you WON’T be surprised with the results — FAMILY. Premise # 3: Children who grow up in a Christ-centered home where they feel loved and secure in their relationships with their parents and siblings will not be as peer-dependent. I would like to use my siblings and I as a case in point. But you can ask and interview a whole lot of homeschoolers who grew up with the same set of circumstances and they will probably tell you the same thing. You can also ask non-homeschoolers who grew up with the same set of circumstances and they will probably tell you the same thing. Given these three premises, I would like to say that socialization cannot be the strongest argument against homeschooling or a strong argument in favor of conventional schooling. Since the family is the most important social unit in a child’s life, this relationship should have precedence and priority over peer relationships. The school system, which keeps children away from parents for most of day, makes it difficult for parents and children to have quality time together and to connect relationally. The school system promotes peer relationships by lumping children together with the same people (class sections) who are of the same age (grade level) for extended hours each day. Given that children are relational and long to be accepted and valued by others, they will gravitate towards certain persons within that environment. Some will choose good friends and some will choose bad friends. These relationships will become more and more significant to a child, so much so that they will begin to share the same values and behaviors. A loyalty towards one another will be solidified over time (“barkada”). Personally, this is what concerns me…So great a premium is placed on socialization without really considering the kind of socialization that schools foster. Schools are committed to educating children and they try their best to do so. Children must be grouped by section and leveled for any sort of teaching to get done in an orderly and systematic way. And there are many excellent teachers out there who genuinely care for the welfare of the children they instruct. However, teachers and educators cannot regulate peer influence. It is something outside of their control even if it is birthed within the walls they have erected. Furthermore, the claim that it is necessary for children to learn from their peers and with them is true only because the school system cannot give each child individualized instruction. Therefore, children must be grouped together. The best teacher cannot customize instruction for all forty children. It is unfair to even expect this. So the social aspect of education where children learn along side other children is not so much a necessity for learning as it is a means to educate many children at the same time when you only have one teacher. The other claim, that homeschoolers have limited socialization which disadvantages them, is a perceived “con” amongst those who misunderstand what social development really is. Homeschoolers are not so concerned about whether their children are socialized. They are more concerned about who their children socialize with and how they behave socially. Children are encouraged to develop relationships with their parents and siblings first. Parents pursue their children relationally. They have lots of time during the day to grow close and fellowship beyond the pragmatic levels. And many homeschool parents introduce their children to the most important relationship of all — with the person of Jesus Christ. With the formation of healthy relationships in the home, children are less prone to look to friends for affirmation or self-worth. Their needs are fulfilled by their relationship with God and with family. Therefore, they do not need friends to fill their emotional tanks. Instead, they can focus on being a blessing to others. They socialize out of security and completeness. In this sense, then, homeschoolers are not socially disadvantaged. Rather, they are better equipped to make friends and influence people positively. But I must refer back to Premise # 3. Not all homeschoolers practice Christ-likeness at home. (A majority do.) And having a Christ-like home where parents and children love God, obey, serve, and worship him, and love one another is not exclusive to homeschoolers. This is not about superiority of lifestyle choice. Any family who chooses to make Christ the center of their relationship will experience the blessings of socially well-adjusted children who know how to treat others with respect and consideration if their parents have purposefully taught them to do so in accordance with God’s word. I am not trying to say, “homeschool your children so they will be the best socialized children in the world.” My proposal is this: if socialization is so important then teach your children to love God, love family, and love others (in that order), and model this at home. But don’t say that schools are important because of socialization. Our children need relationship, but in the context of family before the context of school. And don’t also say that homeschoolers don’t have socialization. They are some of the most secure, sincere, and friendly people I have met and interacted with because they know they are loved by the persons who should matter most — God, parents, family. at the end of the day, the evidence of effectiveness will still be our children. i have stopped arguing my way with people who obviously have no clue what they’re talking about. they see my children…some are amazed…some still thinking how pitiful it is that they don’t go to regular school…I look at those who have gone ahead and I’m fueled, knowing that one day, all these, with the grace and love of God, will bear fruit that will last for eternity. Thanks Mike, for your perspective. Didn’t realize you guys were based in Australia. Exciting! May God prosper the work of your hands and bless you both! The Biblical definition of education is the moral training of children that they may know how to align their deeds with the Law Word of God. Education is about Moral foundations not intellectual achievement. The scriptures place the family under the obligation of educating their children in the Law of God. When they rise up, when they walk by the wayside, and when they lay down. The Law of God is the schoolmaster which brings men to Christ. Modern man is in need of a revival, a return to the teach of and obedience to the Law of God. The catechism of the Bible starts with training in the Law of God. Hi Ms. Joy… You are certainly one of my inspirations to be a woman of faith and of deep love for God, and I am really happy I came across your blog. Until when are you planning to home school your kids? Would you send them to high school? or, a university perhaps? I’m just curious about college plans, that’s all. Great post guys. Please send us on an article and we will feature it on our homeschooling blog. It’s amazinng in support of me to have a website,which is useful in favor of my know-how. from the rest of the world, Crown King is the perfect place for a couple to enjoy a few days to themselves. Now King George V brings unity by being the ruler of India.